2 1/3 years after beginning medical school I finally was able to start my clinical rotations, a time to learn what I will actually need to know for practice rather than just book work/learning. Getting to this point in my education has been a long and arduous task; especially these past 3 months since taking the USMLE step 1 exam. As I explained in Clinical Prep I completed all the paperwork that is required before clinical placement can occur before I got my step results back so that once I got a passing score I could get my placement immediately. Well that did not go as planned. My scores came back on July 8th, and yes I passed. I had to wait 5 weeks to get them back rather than the normal 3-4 weeks due to the 4th of July as the company incharge of the the USMLE gives their employees an entire week off for the the holiday (must be nice, huh? 🙂 ). Once I received the score report I immediately sent an e-mail to school with my scores attached and thought by the next day I would be cleared to start clinicals by the 9th or 10th but it takes 3-5 business days to get cleared and have your file transferred to the clinical department. Even when that happened it took awhile for the clinical department to clear me as they did not even look at my documents until this time so they had to ensure that everything was turned in and satisfactory. Long story short I finally was able to schedule my first rotation on July 27th, almost 3 weeks after getting my score back. 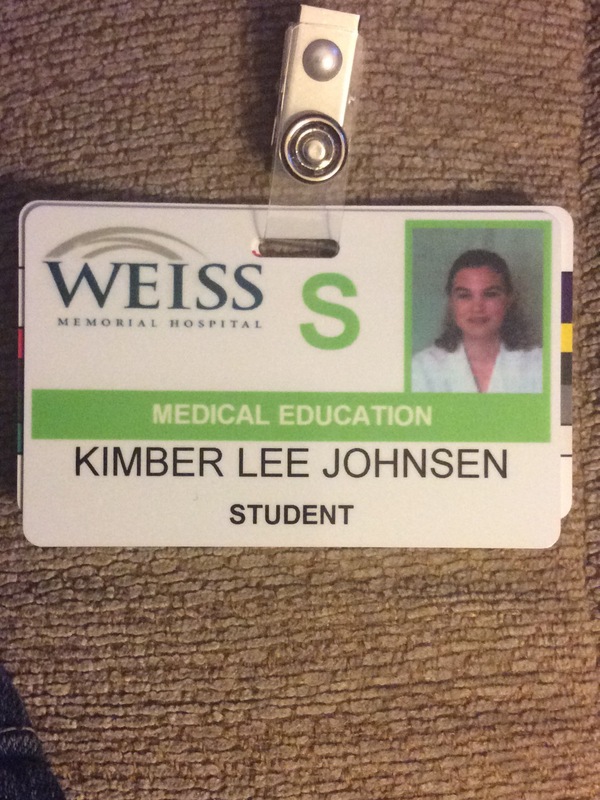 My first rotation, internal medicine, is a 12 week core (completed by every medical student in the states) rotation at Weiss Memorial Hospital in Chicago and began August 24th. That, however, had a little hiccup (it wouldn’t be my story if there wasn’t mountains in my path). Apparently, the hospital application and paperwork that I filled out and sent back to my school July 27th and forwarded onto the contact person at Weiss on the 28th, so I was told by school, never made it to the contact. It was lost somewhere in the internet web somewhere. When I did not hear when my orientation time would be and when to report on the 24th I was finally able to talk to someone on 8/17 after spending a week leaving messages and e-mails. I was put in touch with the contact and Weiss found out she never received the paperwork and she needs to have it 2 weeks before starting so I can be cleared to get my ID and have my credentials confirmed. After doing more paperwork that night I was relying on the power of God to start on time and had lots of friends praying. The 20th I learned my paperwork went through and I was cleared to get my ID badge on the 21st and start on the 24th. When I went to get my ID I was informed that I would be working with a doctor in her clinic and in the ER, including overnight shifts. So yesterday I reported to her clinic and got my first taste of clinical rotations and am loving it so far. I will write more about my rotation in a later post after I complete my first ER shift tomorrow so I can include details of both aspects.